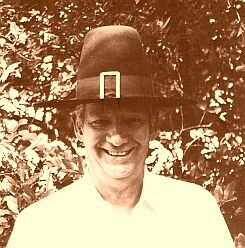 Jack Blanchard's Columns - "Thanksgiving With Uncle Wilbur"
from another stay at the hospital. Boy, have I been misinformed. I just found out It's okay to use the Polaroid Land Camera on a boat. a very interesting book about anti-gravity. I just can't put it down. Still gotta big tree down in my very own backyard. Back at my place now. and then a brief stay at a Rehab center. Luckily I'm doing pretty dandy now. Missed my cats a lot, and getting on the computer. Copyright © Nov. 20, 2004, Will Campbell and friend. All rights reserved.